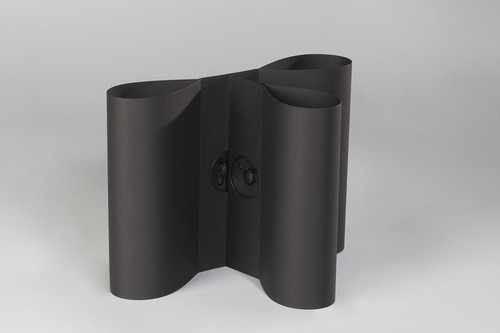 During his residency at Studio Loos Attila Faravelli will offer a workshop presenting his series of artist multiples Aural Tools and will invite participants to compose audio tracks for Trifoglio, a unique immersive listening device based on a mid-side speaker configuration. Max 15 participants, workshop cost €11, tickets available here. The pieces composed during the workshop will be presented during the 41st edition of Hoogtij on May 29th at Studio Loos. Aural Tools was founded by Attila Faravelli, who is also its curator. The practical section of the workshop consists of composing a piece specifically for Aural Tool #1, Trifoglio. “Trifoglio is a low cost audio player, assembled by hand with simple parts, that provides a unique listening experience. The device is based on an unusual mid/side speaker configuration, which applies to sound diffusion a technique commonly employed for stereo microphone placement. 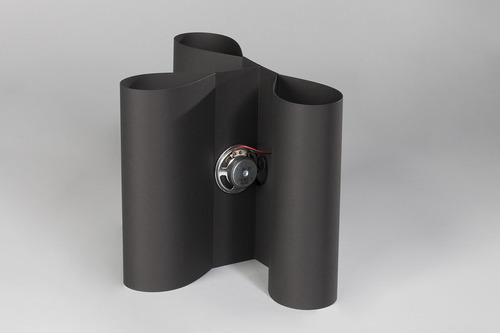 Two small 0.5 watt speaker cones are placed at 90 degrees to each other within a folded cardboard construction which replaces the speaker cabinet and also functions as a sort of parabolic reflector, directing the sound towards the listener. Holding Trifoglio with two hands directly in front of the head, just as one would hold a book, envelops the listener in a sonic hologram, giving an impression similar to listening with headphones but with the addition that tactile vibrations are conveyed through the hands. Although the object is intended for one single listener, the audio player also interacts with local room acoustics and does not isolate the listener from the environment, as headphones do, and it engages in an interesting way with the body, giving the listener the possibility to modulate the sound field by changing the position or orientation of the player. Using components usually found in cheap, low fidelity media players, Trifoglio effectively delivers a holistic listening experience that in terms of spatial imaging goes beyond what high end speakers are capable of achieving. Attila Faravelli (IT) explores the relationship between sound, space and body. His solo music is released by Die Schachtel and Senufo Editions. In duo w/Andrea Belfi (Tumble) he released on Die Schachtel, on Boring Machines with Nicola Ratti, on Presto!? with Nicola Martini and on Mikroton Recordings with SQID (Mario De Vega, Angelica Castello, Burchard Stangl). With Enrico Malatesta and Matija Schellander he has published on his own Aural Tools editions project, consisting in a series of acoustic devices for relating sound to space, the listener, and the body in ways unavailable through traditional recorded media. The workshop is offered as part of the guest residency program hosted by iii in cooperation with Studio Loos and Satellietgroep at the DCR, with financial support from Stroom Den Haag and the Creative Industries Fund NL.